Q: What’s this “EP” thing everyone is talking about? A: "EP" is a common abbreviation used when referring to the ESO-Community Patch (also shortened to ESOC Patch). As summarized above, EP is a balance and content patch designed to improve the gameplay experience without making major gameplay changes. Q: Does EP work for vanilla AoE3 without expansions? A: No, the patch is based upon the game's latest official version with the expansions included, and requires The Asian Dynasties to be installed on your computer. Q: Can I still play non-EP games? A: Yes! After installing, you'll simply have a new desktop icon to access the ESOC Patch Launcher (pictured above). You can still access the original game version in whatever way you were used to − in fact, you can even use the ESOC Patch Launcher to launch the regular game version (using button "Official Patch"). Q: Are the ESOC maps included in this patch? A: Yes, all the ESOC maps are included in the patch installation and available for rated play in multiplayer. Installing the patch will also make the maps available on the official patch as "custom maps" for unrated play. Q: Does the EP protect me against cheaters? A: The development team has implemented protections against known cheats and will continue to improve them in order to keep the EP a safe place to play. Q: Is this based on the AgeSanctuary FanPatch? A: No, the EP is a new project unrelated to AS FP. Q: What is the Treaty Patch? A: It is a separate patch with its own balance changes and new maps designed for competitive play of the Treaty (no rush) game mode. It comes bundled with the ESOC Patch installation by default, and shares features such as the anti-cheat protection. Q: What is the XPMOD? A: It is a special kind of mod with one sole purpose; instant homecity leveling. If you're in need of leveling up your homecities, check the full usage guide here. Q: What is EP Beta? A: EP Beta is where new EP versions are first released and tested by volunteers before we roll the changes out to the general public. For more information, see the dedicated EP Beta FAQ here. Q: What is EP Smackdown? A: EP Smackdown is a separate branch of EP containing experimental changes not vetted by the regular EP balance team. The main purpose of the Smackdown patch is utilizing it for special Smackdown events. Q: When I get on ESO, many games show up as “≠EP” and I can't join them! A: You can only ever join game rooms hosted on the same game version/patch/mod that you have currently launched. Games that show “≠EP” are games that are not hosted on the EP or are hosted on a different EP version. Q: Can I play the EP on GameRanger? A: Yes, GameRanger is supported, although you will find most games hosted on ESO, the game's built-in multiplayer platform. To use EP on GameRanger, follow this guide. Q: How do I install the EP? A: Simply download and run the installer. If you are running into issues, you can post in the tech support forum. Q: My EP installation is crashing, what to do? A: Ensure it is not blocked by anti-virus software on your computer. If you still experience crashing, post in the tech support forum. Q: How do the simultaneous installs work? Will it take up a lot of space on my computer? A: EP utilizes the most advanced modding techniques, it is essentially coded as a small expansion to your game and only takes up necessary space while mostly reusing game assets that are already on your computer. Q: How will I get new updates for the EP? 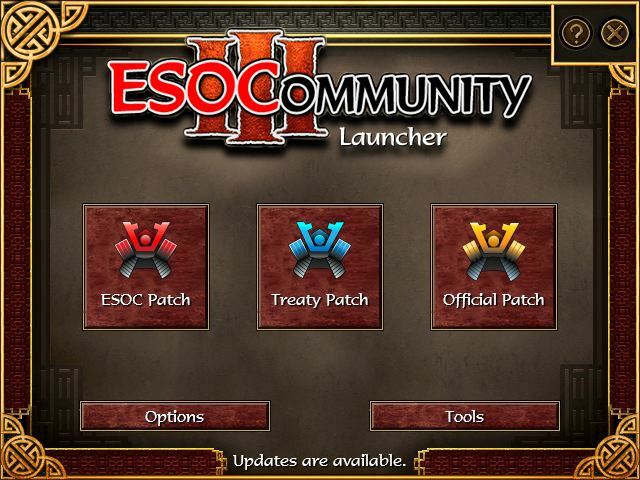 A: The ESOC Patch Launcher will automatically prompt you to keep your game up to date. Once you’ve installed the patch, you won’t have to reinstall or fumble with files every time the patch updates: the latest version is always one click away. Q: Does the EP work with the Steam version of the game? A: Yes, the EP works with any method of purchase. Q: I lost my desktop shortcut. How do I create a new one? A: You can simply reinstall the patch to have a new shortcut created automatically. Q: I play the PC version of the game on a Mac/Linux. Can I play the EP? A: This guide should help you out. Q: The EP simply does not do anything when I launch it. A: Ensure it is not blocked by anti-virus software on your computer and that the Visual C++ 2017 redistributable is installed.